Are you passionate about p2p lending or p2p microfinance? Would you like to contribute reports, news and experiences related to this topic from your country? Are you willing to research the details and look beyond the marketing messages of the p2p lending companies? Become a guest author at the P2P-Banking blog. Your articles will be posted under your name. You will frequently share news, information and latest developments on p2p lending and how the established banking players in your country react on or embrace these trends. P2P-Banking.com is especially seeking guest authors from Italy, Spain, Poland and Japan, which are fast growing p2p lending markets. But we do welcome writers sharing their knowledge and experience from other countries. Maneo introduces guaranteed p2p lending in Japan. On the new “G-Loan” the lender does not need to worry any more about defaults. Minimum investment is only 10,000 JPY (approx. 100 US$). The loans are guaranteed by Orix Credit Corporation which entered into a partnership with Maneo. The downside is that on “G-Loans” the lender only receives 1.5% interest. In my view the choice whether it is a guaranteed loan or not should not be the borrower’s, but only for the lender to choose when bidding. With an interest rate of only 1.5% the only merit of this model for lenders is that he can not lose money when bidding on a guaranteed loan. 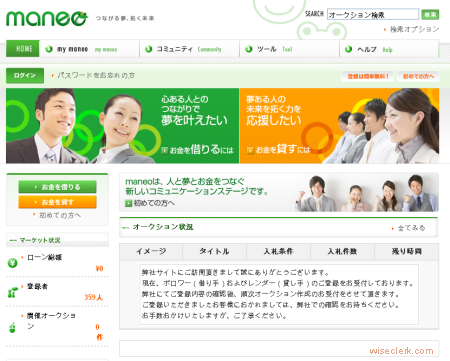 Maneo.jp today launched the first active p2p lending service in Japan. The service connects lenders (aged 20-65) and borrowers (aged 20-60). Maneo verifies the identity, credit grade and the income of potential borrowers (minimum annual income required is approx. 30,000 US$). Borrowers then create a loan listing and set a maximum interest rate. Lenders can bid on the loan through an auction process. Maneo received venture capital from J-Seed Ventures Inc. and Yasuda Enterprise Development Co., Ltd. The last funding round was in April 2008 for 80 million Yen (approx. 0.75 million US$). The first funding round was in April 2007. The company website currently says “Coming in Summer 2008”. 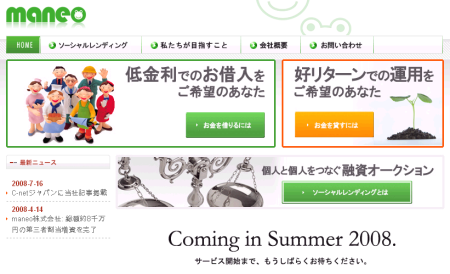 Zopa and Prosper also have announced plans for Japan, but no launch date has been set so far.